As a creative, there will always be more to learn, more projects to get done, and more money to be made. So how can we feel successful? The very nature of being creative means that you are creating things that others haven’t created before. This can be very exciting, but it means that there isn’t a chart you can compare yourself to and know if you are successful or not. And that’s why this week’s Creatively Confident topic is 3 Ways to feel successful as a creative. Before we get into it, here’s the YouTube video on how to feel successful as a creative. If you answer the question in the video, you’ll be entered to receive the physical print totally free. As I created this video, I got really frustrated. I wanted to give up on it several times because it just wasn’t going to be a success. How fitting for this topic, right? But I kept going and I’m proud of the final result. I am giving it to you as a free 8×10 download here. Everyone is going to have a different perspective on what success is. We often use numbers to define success because they are easy and quantifiable. If someone has a certain number of followers on Instagram or YouTube, they must be successful right? Or if they’ve made a certain amount of money, that makes you successful… You have to decide what your goals are and how you define success. And then work hard to achieve those goals because they’re what you want, not what someone tells you that you want. There are goals that you might accomplish that have no numerical value, but you can still be proud of them and feel successful. A few months ago on Instagram, someone messaged me saying that they wished they could be “successful” like me one day. What they didn’t know is that the night before I had been complaining to my husband about how I wasn’t successful. What this person saw of me looked successful to them. But because I felt like I was in a rut, I didn’t see myself as successful. No matter how many people tell you that you’re successful, you won’t believe it until you feel it yourself which brings me to my next point. There are two sides of the coin with this one. On one side, we see others having success, and it’s easy to feel like somehow we can’t be successful because of it. I’m sure you’ve felt that before even though reading it here sounds silly. On the other side, we look at others having success, and we may think that’s the only way to do it to be successful. It’s actually the opposite. You are going to be the most successful when you are being true to you and what you’re passionate about. Some of that might look similar to others but it won’t be exactly the same when it’s coming from you. For example, I have my practice sheets for 26 Ways to Letter the alphabet. I know I am not the only person who has written a letter in multiple styles. Was I copying someone? No. It was how I experimented with finding my own style so I knew it worked for me. I was excited and passionate about it, so I kept my eyes on my own paper, and I created something that has helped a lot of people. When you’re afraid to create something because you don’t think it will be successful or you’re not good enough, just keep yourself going by thinking, “If it helps one person, it will be worth it.” Even if that one person is you, it’s worth it. Can this guarantee that you will make the money you want or gain the likes or followers you want? Maybe not, but it will help you feel successful no matter what so you can try again to reach your goals. When I was creating Fearless Lettering, I had a lot of struggles along the way, not only with production, but with my own confidence. I was creating something I had never seen before. I hardly had any sales in my Etsy shop so I had no idea if I was putting so much time into something that wasn’t going to sell at all. But all along the way, it was helping me feel more confident in my own lettering and life. That was worth it right there. I knew that had potential to at least help one other person and that’s what kept me going. Fearless Lettering has been more successful than I expected or had the confidence for in the beginning, but I’ve also put things out there that didn’t sell at all. Like ZERO sales. On things I was excited about. Does that mean I’m not successful? No, we have to separate that. The product maybe wasn’t successful, but we are successful because we were brave to try something new. And then we get to keep trying. Maybe the product just needs to be marketed differently. Or maybe it’s needs to be changed a little so it’s better for your following. I am currently working on a new project that is different for me and a little (ok, a lot) scary for me. 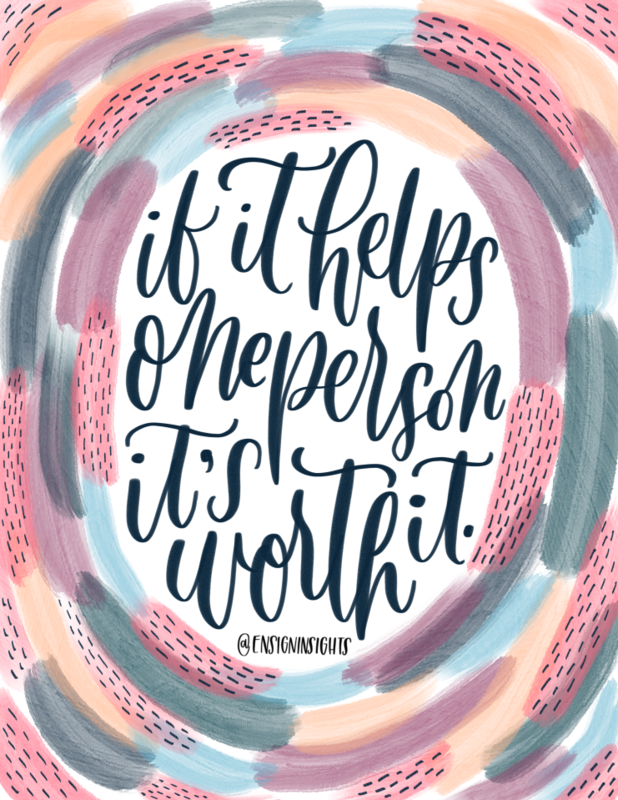 I have found myself saying over and over, “If this helps one person, it will be worth it.” My husband was the one that pointed out that I said the same thing during the process of creating Fearless Lettering. My poor husband is so supportive to listen to all of my woes. The point is, if it helps us be brave and put our creations out there, we have to do it. We’ll never know if it will be “successful” or not until we try. 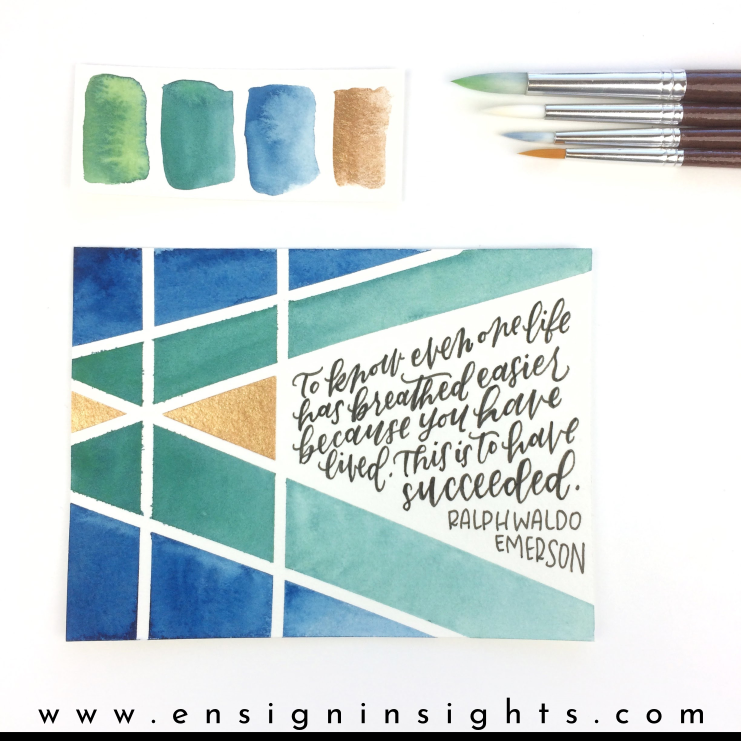 As Ralph Waldo Emerson says, “To know even one life has breathed easier because you have lived. This is to have succeeded.” Do you agree? How do you define success? 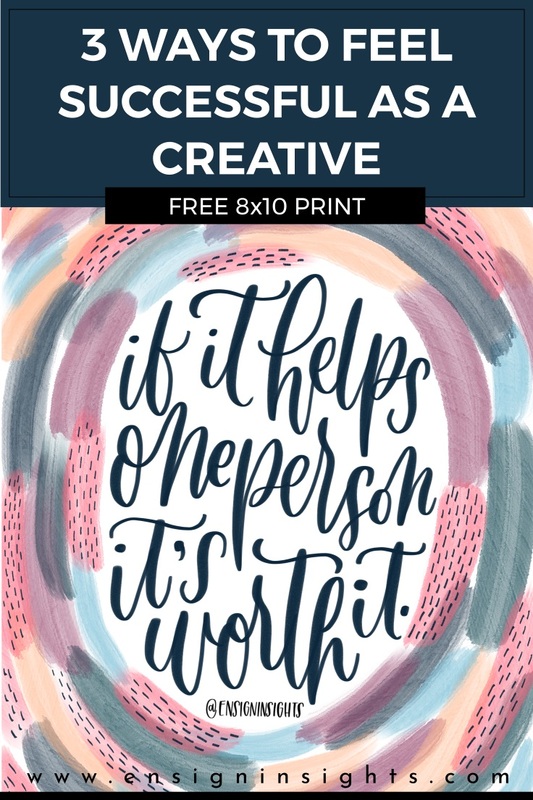 In case you missed it, download your free 8×10 hand lettered print here!